When we think of Yoga, we often envision calm people surrounded by a serene and technology free environment. As they move from pose to pose, carefully breathing, we are very aware of the lack of devices. Afterall, our society is increasingly becoming reliant on all things digital. However, it may come to surprise many of us that technology and Yoga do go together. Today’s technology is overlapping into athletic wear using haptics to change the way we exercise. Haptics is basically the study of how touch and technology can interact. Most of us have experienced this in a round-a-bout way when our phone vibrates in our pocket or if we feel a buzz on a gaming controller. These experiences are rudimentary, because the world of haptics is just starting to unfold as virtual reality and new technologies become available. Today’s tech is finally able to begin indulging all of our senses in ways that have only been dreamed of for decades. This surge in development is due to faster processors, cheaper supplies, and new devices. While many developers have been applying haptic studies to virtual reality and gaming systems, some clothing designers are beginning to utilize the same concepts into smart active wear to help athletes. Today’s athletic wear is now coming outfitted with a variety of technology ranging anywhere from fabric that compresses muscles to garments that can monitor vitals. Take for example a Ralph Lauren shirt that is outfitted with data transmitting sensors that can communicate with an app to track the person’s heart rate, breathing, output of energy, and even their stress levels. There are other similar versions on the market from companies like Hexoskin and Athos, but the premise is still pretty much the same. In addition to gaining biofeedback, there are also advancements in smart fabrics. Athletic wear in particular, is actually being designed to provide resistance in troublesome areas to help boost toning and burn more calories during workouts. By choosing the right workout apparel, people can achieve their physical fitness goals by working smarter, not harder. This influx of smart athletic apparel is transforming our comfy Yoga pants by making them interactive and high tech. Some high end yoga clothing is equipped with electronic components that provide haptic feedback with vibrations to help you master poses and techniques. Using an app to illustrate poses, the clothing uses wireless technology to send data to the pants and adjust the buzzing frequency and intensity to help guide our body positions to mirror the images being displayed on the screen. This use of technology can help us perfect our form and correctly align our poses. At first sight, these Yoga pants don’t look high-tech or scream at us that they are loaded with smart technology. They resemble our traditional Yoga gear and don’t require wires to be attached. The electrical sensors are woven between layers of nylon at certain points on the body. Cradled within the fabric, the electronics are sitting over the hips, knees, and ankles. These components transmit data between each other which allows them to determine if your body is in the correct position. The sensors are even able to figure out the correct angle and pitch of your legs. When a practitioner poses, the sensors will scan your position and provide feedback with vibrations. These sensations mimic an instructor and can help guide you to being perfectly aligned. When every part of your body is in alignment, the pants will gently vibrate with an “ohm”. Today’s practitioners and Yogi’s are beginning to embrace our love of tech by utilizing it to enhance our Yoga experiences. Like many Yoga enthusiasts, we can struggle with perfecting our forms and need to rely on classes with informed instructors to help us correct our poses. That is where technology can help us perfect our techniques while we try to mindfully breathe our stress away. 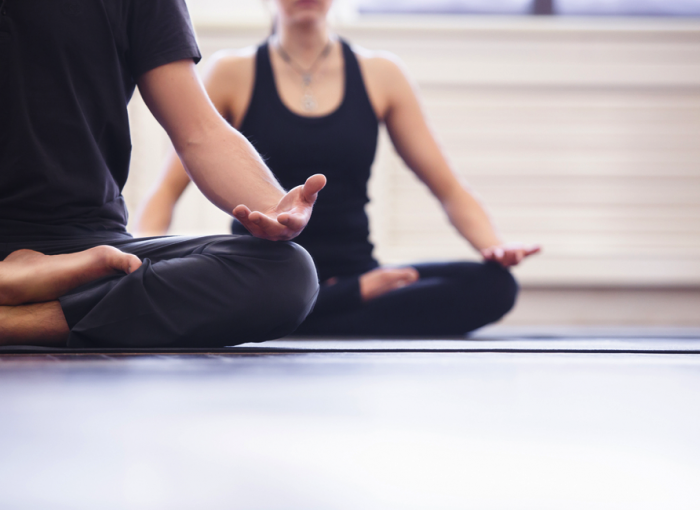 What are your thoughts on using technology advancements while practicing Yoga?